Delicious and nutritious, this diner classic is remade! 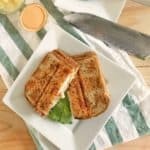 Healthy Pork Loin Reuben, a sandwich you can feel good about eating! Spray a waffle iron with cooking spray. Place one slice of bread down on the iron, top with 1 slice of cheese, 1/2 tablespoon of dressing, 1 tablespoon of sauerkraut and pork loin. Repeat, placing the sauerkraut, dressing, cheese and bread on top of the pork loin. Press the waffle iron down and let cook 2 to 3 minutes, or until whole grain bread is browned. Cut in half and enjoy with a side salad!